The 911 calls came in faster than police could handle them. Multiple shootings. A woman stabbed in the head. Burglaries. Three car crashes, one of them fatal. A missing girl, another getting beaten. A suicide threat. It all happened in a half hour on Dec. 21. With only a few squad cars available, Detroit police took more than an hour to respond to some of the most dire calls. In 2018, police averaged nearly 40 minutes to respond to priority one and two calls, the most urgent crimes, from burglaries and armed robberies to homicides and kidnappings, according to nearly 1 million official police dispatch records for the past two years obtained and analyzed by Motor City Muckraker and Deadline Detroit. That makes Detroit one of the slowest police departments in the country, according to a study by Safe Smart Living and it’s getting slower. A computer analysis of the records shows police are taking longer to respond to priority one calls, which are for the most violent and urgent crimes. In 2018, the average response times for priority one calls increased to 14 minutes and18 seconds, up from the previous year’s 13 minutes and12 seconds. Response times to priority two calls, which typically involve emergencies such as robberies and hit-and-run crashes, reached a whopping 54 minutes and 42 seconds. Our analysis of every police run contradicts the average response times touted by Mayor Duggan and Police Chief James Craig, raising serious questions about the veracity of the city’s crime statistics. At the 2018 State of the City address, Duggan said average response times were continuing to decline. “It’s a far cry from the days when 911 calls averaged 30 minutes,” Duggan told an applauding crowd. Detroit Police Chief James Craig. Photo by Steve Neavling. Police told us the average response time for priority one calls is 12.5 minutes, which is more than two minutes faster than our analysis found. For priority two calls, Assistant Police Chief David LeValley Police Chief said the average response is about 23 minutes, much quicker than nearly 55 minutes. Craig and Duggan declined to be interviewed for this series to explain the discrepancies. 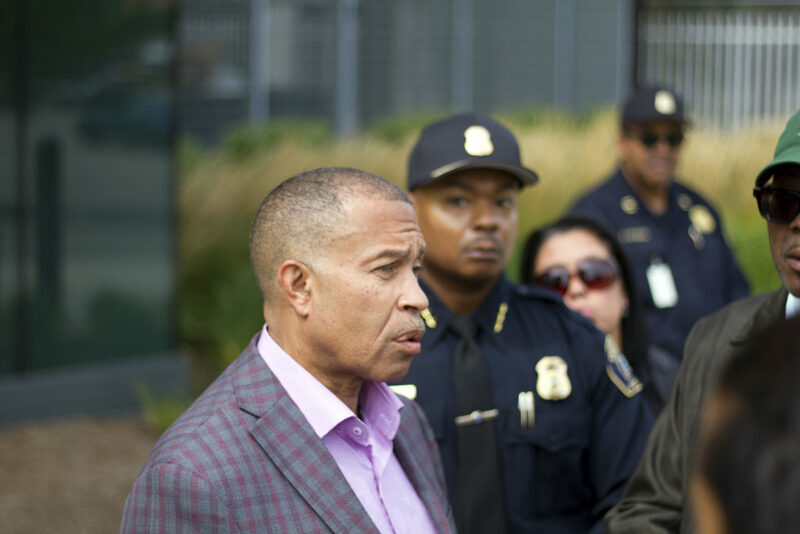 “We are not being proactive anymore,” Mark Diaz, the outgoing president of the Detroit Police Officers Association, recently said on No BS News Hour with Charlie LeDuff. The discrepancy between what the city reports and what our analysis found is fairly simple: The city is deflating average response times by changing how calls are categorized. For the past three years, for example, police have mislabeled more than 10,000 traffic stops as priority 2 calls, which the city defines as emergencies including assaults, armed robberies and accidents with injuries. By including the traffic stops, which have a response time of zero minutes, the police administration is giving the impression that officers are responding to urgent calls faster than they are. The department also is increasingly mislabeling thousands of violent crimes as priority two calls when they should be priority one. Response times are also rising because officers no longer feel safe writing their reports while parked on the street, so it’s customary for them to drive to the precinct office and finish their paperwork in the parking lot, according to interviews with more than a dozen officers, sergeants and lieutenants. And when police make an arrest, they said the intake process is about two hours, further diminishing police presence. Truth is, response times – the most basic measure of police service – are abysmal. Public safety was supposed to improve after Detroit emerged from bankruptcy with a clean slate and a $120 million loan to improve city services in December 2014. But by many accounts, including violent crime statistics, the city is far less safe. Consider this: The department’s ranks have shrunk about 25 percent since 2008, even as the number of 911 calls continue to climb. As 911 calls mount, DPD has 160 unfilled vacancies for street cops. It has gotten so bad that retirees are lured back to work for $24 an hour. In 2018, the number of police runs spiked 39 percent over the previous year. Without enough officers to respond in a timely fashion to even the most violent crimes, police are making fewer arrests and spending less time investigating crime scenes, according to a review of police reports. Between 2014 and 2017, arrests declined in Detroit by 35 percent, according to data provided by the Michigan State Police. The police department has failed to attract and retain new officers. And it’s no wonder. Pay is down, pension benefits have been slashed and the job is more dangerous. When officers report to work, they are given a list of crimes that the previous shift had no time to investigate. The list grows as police are dispatched to an endless stream of priority one calls, records show. It’s not that the city doesn’t have the money to hire new officers. Since 2014, the city has forked over hundreds of millions of tax dollars to wealthy developers for projects like the Little Caesars Arena and the Hudson’s site. Still, the mayor wants the police department to cut its budget by 5 percent. For residents like Sharon Fields, the priorities are baffling. Last year, she crawled under her bed and called 911 when she heard an intruder in her house in the middle of the night. Four hours after the burglar left with her TV, wallet and other belongings, police finally arrived. In most cities, police arrive to violent scenes with backup. That’s often not the option in Detroit, which often ranks first or second among the most violent cities in the nation.